ABSTRACT: A case study is being done on the student named Kishan Kumar, who has poor performance in all subjects and classroom activities. He has admitted in class too much lately. In the class, he is the elder than all other students. He is not interested in his study. Hence it is very difficult to teach him. Whatever I teach in the class he is not able to learn and sometimes have to repeat again and again. Many time, whenever I have given class work he was unable to do it. Therefore to know the reason for his poor study I have taken up this case study so that I came to some conclusion and could help him in improving his study. 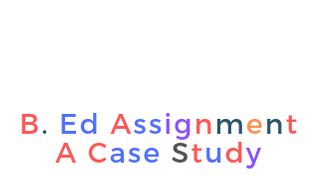 The information contained in the case study report is just for the purpose of fulfilling the condition of the Gauhati University, that is compulsory in our B. Ed course which has to be submitted to college authority. The information provided in this report is true, a proper observation has done before preparing the report.T he contains this report must not be disclosed or copied without the investigator consent. The statement and opinions expressed in this report are those of investigator and did not necessarily reflect any other’s person. Whenever I have been doing the class in six. I have found him least interested in maximum subjects. After teaching certain part of the lesson, if I asked any question to him, he is not able to reply, or If I give him any class work, even though I have given some example, he is not able to do by himself, which shows that he is poor in all subject , therefore it is a great attention to improve him and to know his drawback and difficulties . He has a second physical and mental stability. He is very good at playing sport, physically he is very fit. He has a good mental stabilities. But do not do his regular activities. 2. Family:- His father ‘s name is Mahesh Kumar, and his mother name is Lakshmi Mandol. He belongs to the broken family. He stays with his mother because now his father and mother do live together, his father had left them. His father is not a perfect person. Hence he stays with his mother. They are very poor and his mother is too much trouble to earn money for him. She loves him very much. His mother is an illiterate person. But she wanted her son to study hard. So his mother sends him to school every day, and she regularly asked him to study the lesson. But he is not interested to study. She loves like to play with his friends, and he spent the most time with his peer group. Sometimes he works to another shop to earn some money. He has taken admission in Hindi Vidyalaya High School, Rangia in this year. He is elder among all students in his class because he has been gaping his study due to the financial problem at Bihar. After a long time whenever come to Assam in 2017 he has taken admission here in class six of Hindi Vidyalaya High School, Rangia. He is interested in his school, also he comes to school regularly, but have no concentration is his class. Because was unable to catch his lesson due to lack of previous knowledge. He loved to come to school regularly only for friend circle. At school, he wastes maximum time with his friend Shan Kumar Singh. Shan belonging from a rich family and Kishan is from the poor family. Many time Shan help him to foot various spices items. Also, he disturbing his peer group, he is a very talkative nature during the class time. He creates nosing problem in the class. In the class he maximum time waste by making fun with opposite gender peer group. Time to time he was punished in his class by the class teacher. As a result, his learning came dull condition. But other hands he is expert in extra co-curriculum activities like the game, arts, singing, dance etc. but he never finishes his class work. 1. What is the age of the student? An s:- 12 years old. 2. Is he interested to come to school? 3. Does he like making friends? 5. What is his father? 6. Do his parents have and love and care him? 7. Does he read any subject properly? 8. He is from in which medium school? 1. It is very essential for his belong to a good family. 2. It is very important for too much love his family. 3. He stays with his mother and father. 4. His mother is an illiterate woman but she encourages her son to study hard. 5. He is happy with his family. 6. His mother spends must time with him. 7. His mother always guides him to timely reading. 1. He must be guided properly especially in his studies. 2. He must be engaged in a good tutorial institution for the proper guideline. 3. He must be motivated by his parents as well as the school teacher. 4. He must be given special attention in class also. 2. Illiterate:- Unable to read and write. A healthy family is a strong factor for making personal life better. Hence in the above study, we come to know that Kishan’s father is a Labour, thus he is unable to give more time, proper guide and sufficient money to his son while study. Therefore I think we must able to manage the proper time so that he can give enough time to his only son. As Kishan is not very much good in study particularly in all Subjects.